ENGLEWOOD, Colo. (AP) — The Denver Broncos already lost one quarterback. They can’t afford to lose another. So, they have to protect the passer better in San Diego this weekend. It was the beatings that sent Peyton Manning to the sideline with a foot injury and it’s the clobbering that Brock Osweiler is taking that have the Broncos concerned about him, too. “Yeah, real concerned,” coach Gary Kubiak acknowledged this week. Osweiler has been sacked 11 times in 10 quarters since replacing Manning in the third period against Kansa City three weeks ago. “That’s way too many,” Kubiak said. Manning was sacked 15 times in 34 quarters. Osweiler took some really big hits while bringing the Broncos (9-2) back from a 14-point, fourth-quarter deficit against New England on Sunday night, a game Denver won in overtime, 30-24. 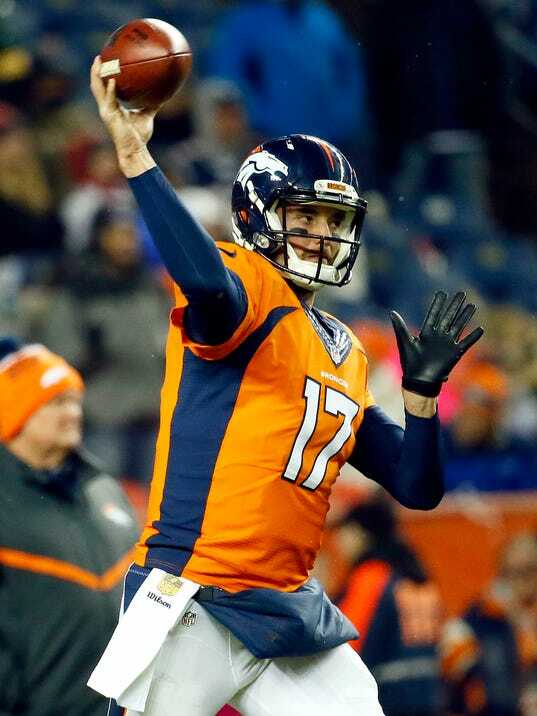 Although Osweiler would get up, dust off the snow and keep right on going, you can bet Kubiak and general manager John Elway cringed, especially when Osweiler limped away after one hard hit.